Sound What they lack in bass extension they make up for in every other area; "as sweet, smooth, extended and detailed as I could ask for"; "extraordinary soundstage width" and "excellent midrange detail." Features High-quality parts and drivers and very inert cabinet; sold factory direct with return privileges; stands are $200 when purchased with the speakers. Use John had very good results with a Velodyne subwoofer to augment the bottom end, but others should work too. .special and a real value." Ever heard of Tyler Acoustics? Me neither. Not until right before I received a pair of the companys Reference Monitors, that is -- the Taylo Reference Monitors, to be exact. So then there were two questions: who is Tyler Acoustics and just what is a Taylo? It turns out that Tyler Acoustics is a small and young (about a year old) company headed up by one Ty Lashbrook. The company is named after his little boy and is based in Owensboro, Kentucky. A long-time audiophile, Ty figures that hes owned about 300 pairs (!) of speakers over the years and finds one common thread throughout the experience: they all cost too much for what he got. Mr. Lashbrooks solution was to start building his own speakers. After that it was the same old story. Friends would hear them and want a pair of their own. Today he works in a 3500-square-foot facility where he performs all phases of speaker production with the exception of the application of the final finish to the cabinets. As of yet he doesnt have a "clean room"-- all of his completed cabinets are subcontracted out for the final finishing and then returned for final assembly -- although Im told that this is going to change very soon, probably by the time you read this. Ask Ty about the origin of the name Taylo and he will relate to you a story about a prescription-medicine bottle intended for his little girl, Taylor. The "r" was left off the label, and the little girl had a new nickname, Taylo. While its a cute story, it tells you something about the position of the Taylo Reference Monitor in the line. You dont name something you are not intensely proud of after daddys little girl! 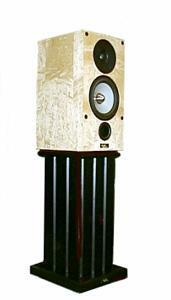 Along with the Taylo Reference System (a modular full-range system selling for $5800), these Taylo Reference Monitors represent the premium tier of the Tyler Acoustics line. While you are asking questions, ask Ty to what he attributes the sound of his speakers, and hell start going on about the parts list. Ty doesnt skimp on the parts he uses in this $2450-per-pair monitor. He starts with the widely respected Scan-Speak Revelator tweeter. Its an expensive 1" textile dome with a 5" flanged fascia. Then he uses a SEAS 6 1/2" magnesium-coned midrange/woofer. If you havent noticed this sharp-looking cone with its solid-copper phase plug, you havent been paying attention. But you can find it or its smaller 5" sibling cropping up in some very pricey offerings. But the goodies dont end there. How about internal wiring by DH Labs (T-14), Hovland capacitors (only used in line with the tweeters), Goertz Alpha-Core inductors (in the woofers path) and silver solder throughout? And if these werent enough, how about rejecting the usual 3/4" MDF and stepping up to MDF a full 1 1/2" thick? Give these babies the knuckle-rap test if you want, but tread lightly; they have the feel of a cinder block. Now you know how a 9"W x 10"D x 18"H monitor can tip the scales at 38 pounds. Tyler Acoustics also manufactures a full line of audio furniture, from equipment racks to speaker stands. The Monitors came with a pair of the Model 1 speaker stands (normally $435 per pair, but $200 if purchased with a pair of Monitors), which are constructed of MDF, are sand-fillable and drop-dead gorgeous. Incorporated also are beautiful adjustable brass cones, as opposed to the usual spikes. Nice touch. The Taylo crosses over at 2.5kHz with an 18dB slope, and my review system also included outboard crossovers -- a $400 option to appease the tweak in all of us. These were nicely finished to match the speaker stands and were styled to match the amp stands Tyler Acoustics makes. As good as the stands and crossovers look, they dont hold a candle to the birds-eye-maple-clad speakers (a $300 premium finish option). With their magnesium midrange/woofer, the solid-copper phase plug, the flanged tweeter, and marvelous finish, this is one aesthetically pleasing speaker. Sitting atop the full-bodied stand, its an elegant-looking package that now lists for $3350 inclusive of stands. Of course, you didnt come here to read about eye-candy -- beauty may be only skin deep, but we all know that bad sound cuts to the bone. Fortunately, I didnt have to wait for very long to get to the listening. This pair was well broken-in and ready to make music. The system used for most of the review was my Classé 5 preamp, Classé CA-100 power amp, Sony DVP-S500D DVD player feeding a Meridian 563 DAC, and the Sota Jewel/Premier FT3/Sumiko BPS analog system. Wires and cables were DH Labs Silver Sonic T-14 speaker cables (bi-wired), BL-1 interconnect, and D-75 digital coax. The speakers were ultimately placed with the rear of the speaker 31" out from the wall with a very small degree of toe-in. There were no side walls in meaningful proximity. The speakers and my ears formed an equilateral triangle, each leg being just less than eight feet. The 22" stands put the speakers tweeters just a touch above ear level. The good news is that from 45Hz on up, the speaker is almost beyond reproach. With a nominal impedance of 8 ohms (5 ohms minimum) and a sensitivity of 88dB, these are a very easy load to drive. Initially, I brought out all my customary, audiophile-approved recordings and ran them through in due course. Overall I was quite pleased by the Monitors performance. Gradually, though, I became aware that these were really bullet-proof speakers that could stand some abuse. They could play very loudly with absolutely no sign of strain. Tonal balance was exceptionally neutral and just about identical to my aforementioned favorite affordable monitors, the ACI Sapphire IIIs, but unfortunately for my Sapphires, thats where the similarities ended. Forgive the pun, but in just about all other ways, the Taylos soundly outclassed the Sapphires. At less than half the price of the Taylos, the $999 factory-direct Sapphires will survive my comparison, but Ive not encountered too many speakers in and around the $2k price point that can compete with them -- let alone dust them. The Taylos eclipsed the Sapphires in areas of soundstaging, midrange detail, treble extension and articulation, and in overall dynamics. Midrange articulation and detail were as good as Ive heard from far more expensive speakers, and I could detect no obvious coloration. To outshine the treble I had to move up to my $9500 Genesis APM-1s and their superb ribbon tweeter. Then and only in direct comparison did the Taylo fall short -- and then not by all that much. Upon first hearing, I really thought that the treble was a match for the APMs. And even after the comparison, my enjoyment of the speaker was not hindered one iota. It was as sweet, smooth, extended and detailed as I could ask for -- in its class. Additionally, the treble balance, while exceptionally extended, was not such that record noise was accentuated. On the contrary, listening to vinyl was a real joy. Imaging and soundstaging were excellent and exactly what I have come to expect from a small monitor. Image stability (and timbre for that matter) remained excellent as you moved reasonably off-axis, and image clarity and specificity were good from a wide variety of listening distances. You can make the soundstage as wide or as narrow as you like just by moving your listening seat closer to or farther from the speakers. From any reasonable distance, focus remained excellent. Image depth, while pretty good by any measure was, in my judgment, just a little disappointing relative to the otherwise superlative performance. There was plenty of two-dimensionality, so dont get me wrong, but the Taylos just didnt make the rear wall disappear in my larger listening room like my dipolar Genesis APM-1s or the Dynaudio LR-120s that had just vacated the room. In my smaller listening room, the Taylo Monitors did perform better in this regard, as they fully succeeded in dissolving the rear wall. "Here It Comes Again" from Blacks self-titled CD [A&M 75021 5365 3] gave me my first hint at the extraordinary soundstage width that these speakers can provide. I think this was the widest soundstage Ive ever heard, and I dont recall ever hearing sound that far outside the physical location of the speakers before. The music that followed, while not possessing the super-wide effect, was nevertheless unusually wide and satisfying. The opening cymbals on "Feel Like Change" demonstrated the excellent tweeter to good effect. They were smooth, had an excellent sense of presence, admirable timbre and had a wonderful sheen without any undue splash or glare. The line laid down by the electric bass was detailed and possessed of excellent weight. The vocals were bull's-eye center and ever so present on the stage, but the reverberant field was most enveloping. Another area where the Taylos excel is in placing images not just at the height of the speaker, but rather projecting them more than a fair distance above the speakers. The sense of space was excellent, and what a pleasure it is to allow the musicians up off of their knees! Acoustic guitar showed off the excellent midrange detail and transient finesse of the Taylos. You can hear the "click" of the pick against the strings immediately followed by the "ring" of the string. The two events are not blurred together, but are rather portrayed as the two separate events that they are. On "Fly Up To The Moon," also from Black, there is a simple acoustic guitar lead embedded behind vocals, keyboard and percussion. While I cant say that Ive never heard this guitar before, the Taylos gave it a presence that I know it has never had before. The louder I turned this disc up, the "bigger" it got. It was much like using the zoom on a camera. The soundstage got wider and taller and moved forward a bit. While I wouldnt say that you have to crank these speakers to enjoy them, there is an added measure of detail and excitement waiting if you do. "Whos There" from Smashmouths Astro Lounge [Interscope INTD-90316] had me diving into the liner notes looking to see if there was a quasi-surround scheme such as Q Sound or Spatializer at work here. The opening noise sequence was located just to the outside of the left and right speakers, but moved forward into the room, as if along the wall (which isnt there). I dont think Ive ever heard anything like it, and no, the liner notes list no Q Sound. While Smashmouth uses a lot if distortion on their guitars, when they switch it off, its possible to hear what a clean recording this is. This actually makes it an interesting recording when evaluating speakers because it highlights the differences -- kind of a "it feels good when I stop" thing. Once the distortion is turned off, its as if the clouds clear and the sun comes beaming through. Further, a good speaker such as the Taylo Monitor, with its excellent midrange detail, can even decipher a distorted guitar in a way that a lesser speaker cant -- the fundamental tone is not completely overshadowed by the distortion. "Satellite" exhibited an outrageously wide soundstage akin to moving from a snapshot from a 35MM camera to the same scene shot on one of those panoramic ones. While this recording has a more exaggerated soundstage than most, it is duly noted that the Taylos did a great job of giving me what was on the disc. Later on in my listening sessions I added a Velodyne ULD-15 subwoofer to the system. The ULD-15 gives you no choice but to insert an 85Hz high-pass filter in the path of the speakers -- unless you have dual outputs on your preamp, as does my Classé. Using the RCA (unbalanced) connections, I was able to insert the Velodyne between the preamp and power amp. At the same time I was also able to connect the preamp and power amp using XLRs (balanced), which left the Velodyne system out of the loop. I could now toggle between the balanced and unbalanced connections, thereby switching the Velodyne (as well as the 85Hz high-pass filter) in and out of the system. Most subwoofer aficionados know that one of the side benefits of subwoofing is that by relieving the smaller midrange/woofers found in satellite speakers of the burden of producing bass, you can (and often do) experience better midrange detail as well as improved dynamics. But, in this case and given my reasonably (though not insanely) loud levels, I cant say that I could detect that this was the case. As I switched in and out the high-pass filter, I didnt hear much of a difference in the midrange. When operated full range, the speakers remained as crisp and clean as when they were high-passed. Further, when operating full range, the speakers could play louder than I would think prudent and with no deleterious effects on the sound. I would guess that if I wanted to crank the speakers to insane levels, I would eventually hit that point where their midrange/woofers could use some relief, but after extended listening at those levels, what was left of my hearing wouldnt allow me to hear the difference anyway. In large part, I attribute this performance to the aforementioned bass roll-off. What the speaker cant do below 40Hz or so, it doesnt attempt, thereby redirecting its effort toward other, more useful pursuits. The Tyler Acoustics Taylo Reference Monitors are sterling performers. They go loud without strain, they sound great, and they look stunning. At their price, any two of these criteria would almost guarantee success, but all three of them make the speaker special and a real value. Throw in outstanding imaging and soundstaging and these are speakers to grow old with. True, they dont go all that low, but if you require the kind of bass extension that the Taylos cant provide, simply add one of any number of high-quality subwoofers for an exceptionally good full-range system. Or try a larger speaker from Tyler Acoustics -- such as their 7Us, or go to the top for the Taylo Reference System. My only regret, and its a small one, is that I didnt get the "base" Monitors, without the outboard crossovers and premium finish, as I would have liked to hear how good the least expensive iteration of the Taylo Monitor sounds. My guess is that its at least 95% as impressive for $700 less and an even better value. But whatever you do, dont skimp on the stands. At $200 with the purchase of the speakers, they are a no-brainer. They work very well and they look great. In any guise, I highly recommend you seek out a pair of the Tyler Acoustics Taylo Reference Monitors for audition. Price: $2450 USD per pair plus options; optional stands are $200 per pair when purchased with the speakers. We would like to thank John Potis and SoundStage! for their time and effort in reviewing our Taylo Reference Monitor. We think comments like "They go loud without strain, they sound great and they look stunning...special and a real value" say a lot about the quality and love that goes into each speaker system we build. Other comments like "This was the widest soundstage I've ever heard" and "The vocals were bull's-eye center" reflects our commitment to reproducing the best imaging and soundstaging possible by using state-of-the-art drivers and crossover parts. We design and build our own custom Reference stands for the Taylos to place the loudspeakers on a solid foundation and the proper tweeter height. We at Tyler Acoustics build loudspeakers the old fashion way, one at a time!